From today till June 16, you can taste some of the dishes from Gua Hua Lou restaurant in Shanghai without having to fly to China. Chef Sam Gao, head chef of Pudong Shangri-La, is presenting a menu of Huaiyang and Sichuan dishes at Shang Palace in the Shangri-La Hotel. Huaiyang cooking is one of the main Chinese cuisines, and comprises culinary styles from the lower reaches of the Huai and Yangtze rivers in Jiangsu province. Flavours are fresh and light, and cooking methods include braising and steaming in low heat. A Huaiyang dish on chef Gao’s menu is double-boiled beef soup with Yunnan maca ($30). Maca root is a herb that boosts yang energy in the body. Those who prefer stronger flavours can go for the Sichuan dishes which are cooked with chillies and tongue-numbing Sichuan peppers. Check out the classic dish of sauteed chicken with spices and red chilli ($36). Moosehead’s revamped menu features 10 new dishes that continue in the vein of its culinary style – with Mediterranean cooking as its core but mixed with flavours from all over the world and using mostly locally sourced ingredients. But the focus now is on having vegetables and fruit feature strongly in many of the dishes, which is just great for the current hot weather. Fruit and vegetables have high water content and adding them makes dishes lighter and more refreshing. Those who like tart flavours will enjoy the marinated scallops, orange emulsion, seaweed, frozen apple ($19), a mix of sweet-sour flavours in a dish designed to cool you down. The roast beetroot with pomegranate, toasted almonds and ricotta ($12) is wholesome and delicious. And I like that the beetroot here does not have the strong earthy taste that is often found in the vegetable. 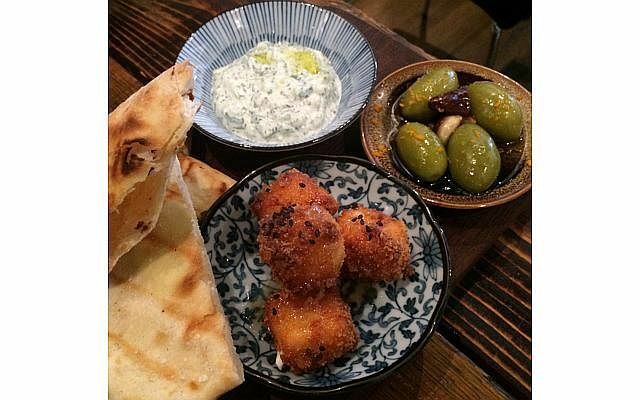 To start, share the meze board ($19) which comprises olives marinated in olive oil and orange zest, tzatziki (Greek yogurt with garlic, cucumber, mint and parsley) and deep fried feta with sesame and honey. 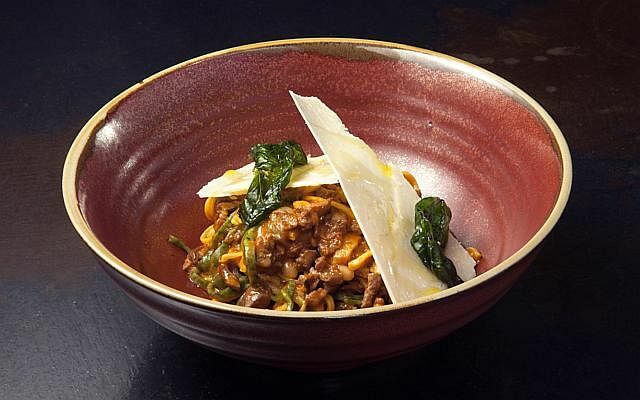 Open Door Policy in Tiong Bahru has also revamped its menu with almost totally new dishes created by head chef Daniele Sperindio in collaboration with chef-owner Ryan Clift. The food is reminiscent of Italian-Australian cooking, with classic Italian dishes given a twist and often with Australian ingredients. Examples are kangaroo fillet, roast brussel sprouts with pine nuts & baby onions, sauteed warrigal greens, vinegar jus ($34) and roast barramundi, crushed rocket potatoes, fresh asparagus, caviar, chive emulsion ($26). My favourites are the pastas, including the paglia e fieno taglierini with hand chopped lamb ragout and shaved pecorino cheese ($26), and plin ravioli of watercress and macadamia, feta cheese, pearl onion and romaine lettuce ($26). Both are cooked perfectly and have deep, rich flavours that hit the spot. Regulars who go to Open Door Policy for the braised beef cheek, black truffle mash, roasted mushroom and red wine jus ($32) will be glad to know, however, that this old popular dish stays on the new menu. And it should. Suckling pig fans have a double treat at Si Chuan Dou Hua Restaurant in Parkroyal on Kitchener Road this month. Unlike the original Si Chuan Dou Hua in Beach Road which specialises in Sichuan cuisine, this outlet in Little India focuses more on Cantonese cooking. And it has an expert in barbecue chef Zheng Guang Liang, who turns out very good suckling pigs. For this month’s promotion, he has come up with two new flavours – barbecued crispy suckling pig with fermented bean curd, and whole pipa suckling pig with minced black garlic and pineapple sauce. I prefer the version with the black garlic, which adds a very pleasant aroma to the meat. And the sweet-sour pineapple sauce goes really well with the roasted pig too. The fermented bean curd version is the same as normal suckling pig, except it is served with fermented bean curd sauce instead of the usual sweet bean sauce. 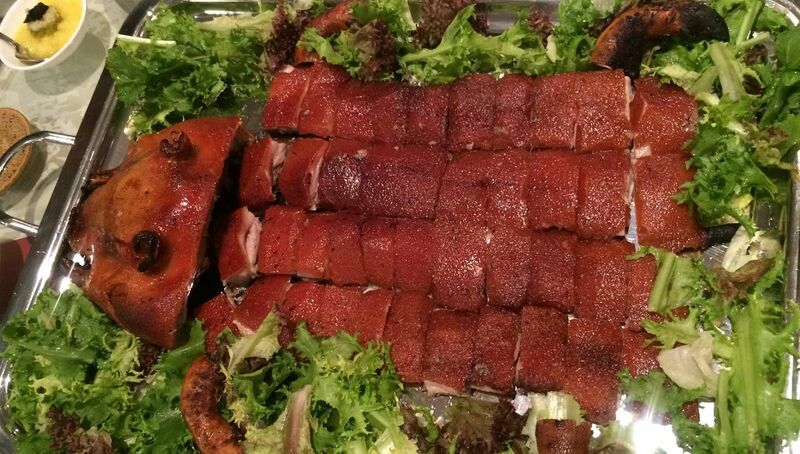 The pigs are available in very good-value set menus priced at $428 for six persons and $688 for 10 persons. After the crispy skin of the suckling pig is served, the meat is used to cook three other dishes: steamed with pearl garoupa in preserved vegetables, stir-fried with salt and pepper, and a choice of mee sua noodle soup or cooked with dried scallops in congee. The meal ends with a dessert of home-made beancurd with wolfberry, which the restaurant is noted for.